Russia's remote Russky Island, which is surrounded by a frozen ocean six months of the year, is well-known for its extreme weather conditions. So, when the Russian Central Government began the tender process for the construction of a desalination plant, they needed a filtration solution purpose-built for unforgiving conditions. The construction of a new 10,000m³ seawater reverse-osmosis (SWRO) desalination plant would support the drinking and process needs of local residents and that of students attending the Far Eastern Federal University - the site of the APEC 2012 Leaders Summit. Global water solutions provider Aqua-Chem Inc, which specialise in constructing SWRO facilities, was contracted to provide the turnkey design and build for the ambitious desalination project. To ensure the filtration system could withstand the inclement weather whilst providing high-quality potable water, the company's team of engineers turned to Waterco's robust and reliable 7-bar rated Micron Horizontal Water Filters. "The Russky Island construction required weather resistant filters with a large surface area," explains Waterco founder and CEO Soon Sinn. "Our fibreglass filters are perfect for seawater applications as they do not corrode like steel or stainless steel and are able to withstand damage from many types of water treatment chemicals. "Furthermore, Waterco's filters are designed with no metal to water contact and are suitable for a long service life due to its high-pressure rating. This is a critical feature in light of Russky Island's remote location." Waterco's digitally controlled filament winding machine provides continuous strands of high-quality fibreglass filament under controlled tension to create an impervious, one-piece vessel. An absence of welds or seams or special tank linings ensures the filter does not corrode or electrolyze. Furthermore, the design and the manufacturing process of the whole vessel incorporates non-metallic fittings and reinforced manhole openings unique to Waterco. Waterco filters weigh a third of the weight of steel vessels while maintaining the same level of strength. This proved to be invaluable when shipping the 12 filters safely to the remote island and installing them in the required short lead-time. "The availability of a large diameter horizontal filter that can be economically shipped anywhere in the world made our bid very attractive," Soon Sinn explains. "In addition, ongoing maintenance is required for steel vessels' anti-corrosive coating and certified welders are required for repairs to the lining - whereas fibreglass vessels require virtually no maintenance or repairs once installed." 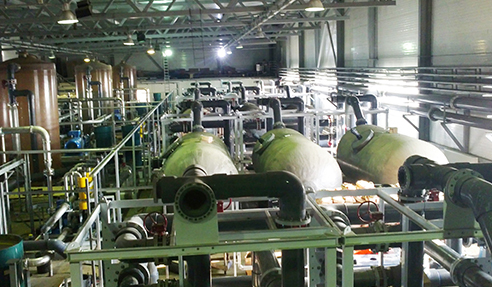 The Russky Island project was Waterco's first in Russia and has since provided a range of vertical filters for several smaller desalination plants, including in Saudi Arabia, the Bahamas, South America and the Philippines. "The Russian SWRO was a significant strategic project for Waterco," says Soon Sinn. "Our filters are created with reliability and durability, and Russky Island was a perfect application." For more information on non-corrosive fibreglass filters for seawater, contact Waterco or visit www.waterco.com.au. I would like to enquire about Waterco Limited.